Double The Pleasure – Can Kevin Ayers follow in Big Brother’s Footsteps? Lost in the flurry of the big names in the draft, a player currently flying under the radar is Kevin Ayers, strong safety and brother to Titans linebacker Akeem Ayers, who tried out at the rookie mini camp for the Titans. 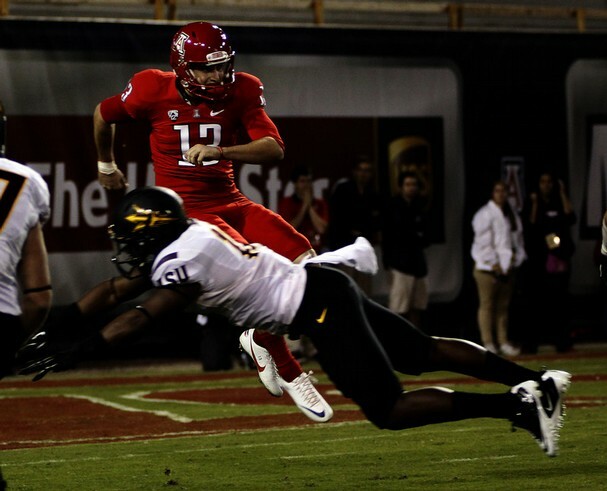 An undrafted free agent out of Arizona State, Ayers played at Pasadena City College and then transferred to West Los Angeles College. At the beginning of his junior year he committed to Arizona State where he had a solid 2 years, playing in the secondary and excelling on special teams. He would block 2 punts his senior year, one against Arizona State that led to a safety. A versatile player who has played linebacker, free safety and strong safety, Ayers is likely a long shot to make the Titans roster. However, he could very well make a good practice squad candidate where he could hone his skills and possibly make it onto the 53, either with the Titans or elsewhere. Ayers is listed officially at 6′ 0″ tall and 202. His best 40 time was 4.57 with his official being 4.66 which compares favorably to other top drafted safeties. His vertical jump was 33 which is a bit sub-par compared to other top safeties drafted. He benched 19 reps. It is often said timing and opportunity is everything and there is certainly opportunity at the safety position with the Titans. There is going to be a lot of competition at the position and watching Ayers when training camp opens should be interesting should he get the opportunity. His appearance at rookie minicamp was on a tryout basis and it is unclear whether he will get an invite to training camp. Next The Vernon Davis Question: Should We Eliminate the Distinction Between WR and TE in Fantasy Football?